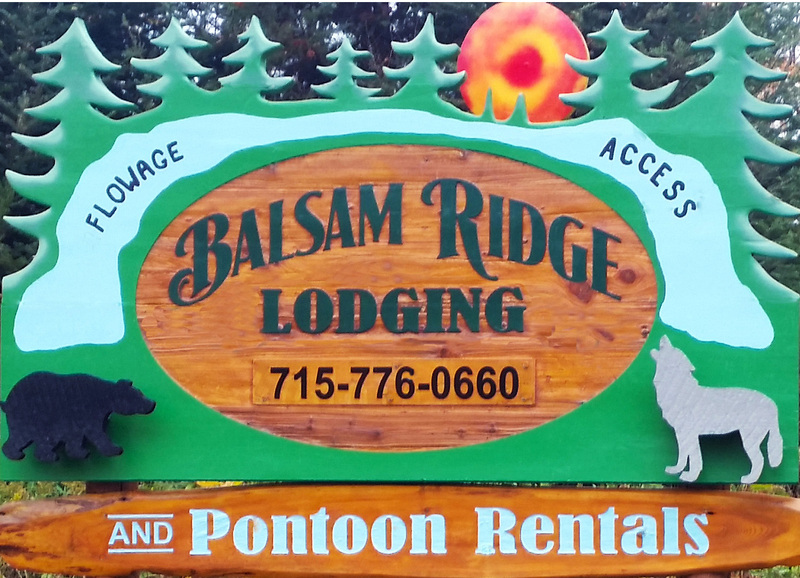 Balsam Ridge Lodging offers two secluded and cozy cabins with their private dock on the Turtle Flambeau Flowage near Mercer, Wisconsin. Our goal is to provide quality vacation lodging surrounded by the beauty of nature. Our cabins are perfect for family and friend vacations, medium or small groups or that private cabin getaway for couples or honeymooners. Enjoy sitting around a crackling campfire and looking up at the stars. It will bring you back to what relaxation is all about. Within a couple minutes you are at the cabins private dock where there is plenty of room for your boat or one of our rental pontoons. A pontoon for your stay (See cabin /Pontoon Special), is a great way to view and photograph loons, eagles, osprey and other wildlife that call the northwoods home. Regardless if you want to fish, explore the many sandy shores to swim or just relax and enjoy the pristine wilderness waters, a pontoon is a great choice. We are a destination spot for snowmobiling, skiing, snowshoeing, ATV/UTV trail riding, biking, hiking and year round vacation fun. Snowmobile and ATV/UTV right from our cabin. After a day on the trails you can relax in the whirlpool. If you are interested in hunting, there are thousands of acres of public forest land accessible right from the cabins. If you are looking for quality vacation lodging nestled in a relatively secluded area with complete privacy for a reasonable rate, then Balsam Ridge Cabins are the place for you. Once you are here you won’t want to leave. In 1992, Wisconsin Governor Tommy Thompson officially recognized what many already knew of the Turtle Flambeau Flowage when he designated it as a protected wilderness area, securing its rugged beauty and unspoiled wild character for generations to come. The Flowage is truly a water wonderland, offering countless opportunities for outdoor adventure. The Turtle Flambeau Flowage is a natural choice for outdoor living, with accommodations for any style of “roughing it”.